For several years, I have seen divers climb aboard dive boats, enter directly from the shore and hop into buses heading to dive locations. I’m always tempted to sign up for a dive retake but since one must dedicate three days for certification, and due to my work schedule, I could not commit. Surely there would come a day when I could scuba dive again, but I would have to plan in advance, hence make sure it was a vacation and not a business trip! 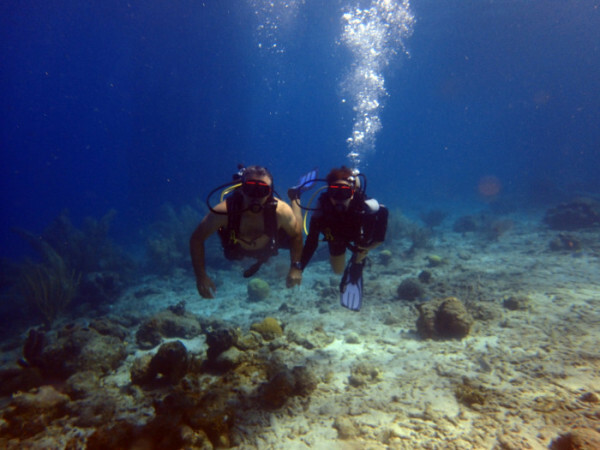 This year, in view of our 16th anniversary, my husband and I finally planned a week long getaway to Curaçao and scuba diving is on the agenda this time. 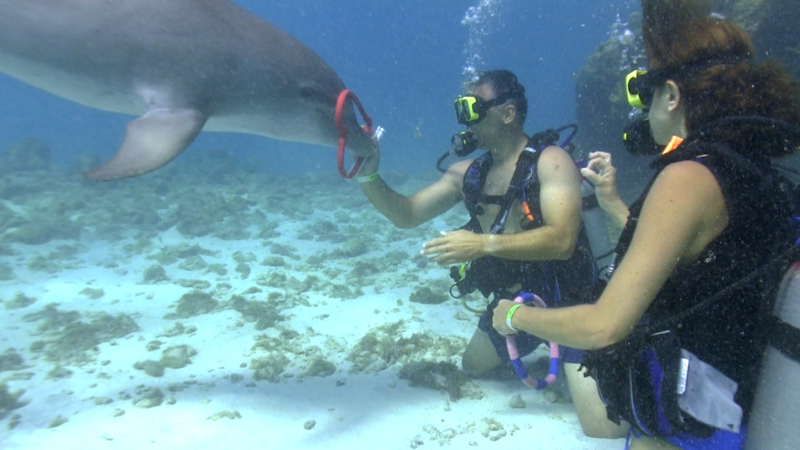 I wanted to bring an element of surprise and romance to our dive experience, so I planned a renewal of our vows in the presence of majestic dolphins thanks to the awesome collaboration of Dolphin Academy, Ocean Encounters and Turtle & Ray Productions. It’s time for our refresher dive, it has been far too long since we both dove. Rudi, the head dive instructor at Atlantis Diving is prepared to take us for my very first shore dive and our first dive together after so many years. 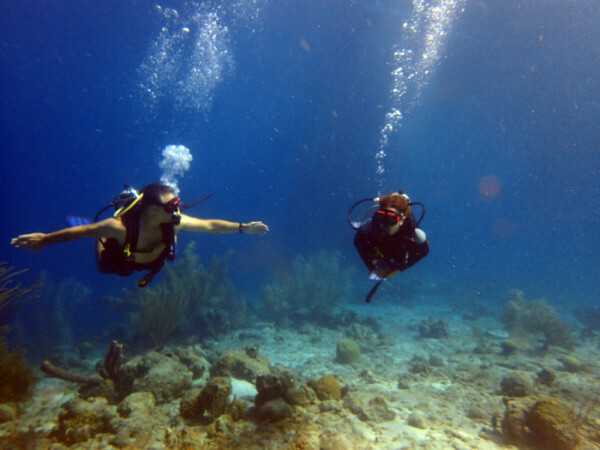 What’s great about shore dives is that it allows divers to customize their diving experience. From the dive centre, we walk towards the shore with our dive gear on and gradually enter the sea, we adjust our gear, slip on the fins and begin our descent. As much as I’d like to say that I picked up where I left off years ago, my body and my mind said something else, readapting to the underwater environment. Nothing to panic about, just relax and continue to breath normally. Within minutes, I’m more at ease finding my buoyant comfort zone. 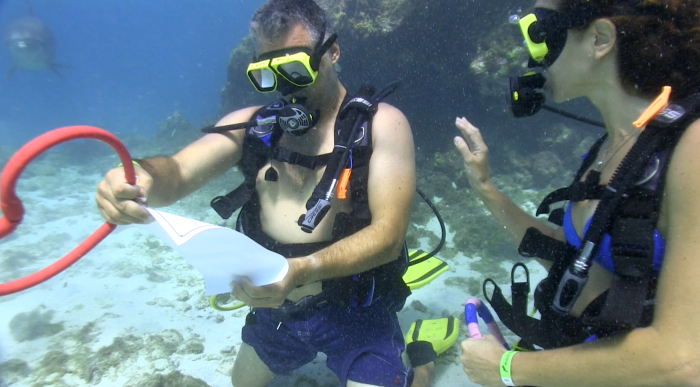 It takes practice to evaluate your buoyancy capacity and maneuver at ease. We gradually descend to 10 meters towards the drop off spotting numerous species of fish such as yellowtail snappers, parrotfish and spotted morays to name a few. As we swim above colorful flower brain corals and anemones, we are relaxed and spend nearly an hour admiring nature’s display of underwater beauty and harmony. On the way back to our point of entry, Rudi points out to several small fixtures, secured to what used to be a healthy reef. They appear to have algae and small coral formation growing on them. Later, Rudi explains that it’s part of the initiative of Coral Restoration Curaçao to preserve and sustain coral life. 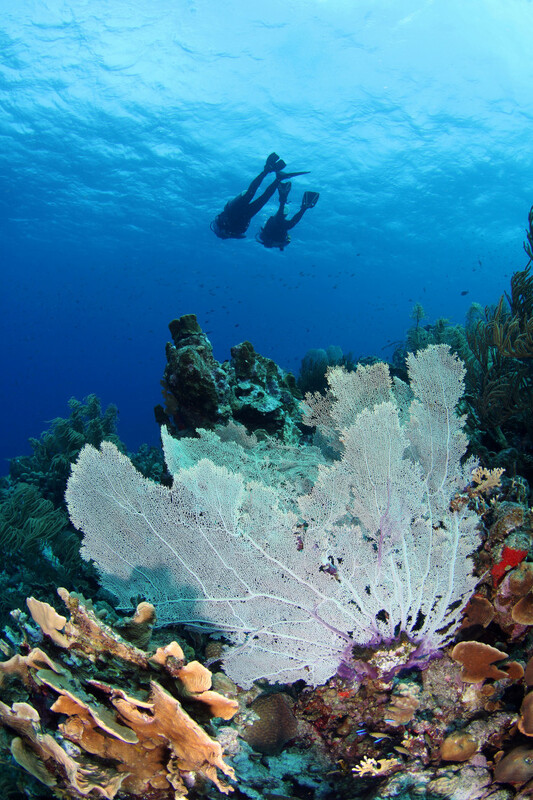 This project shows a lot of promise for the future reefs abundant with undersea life. 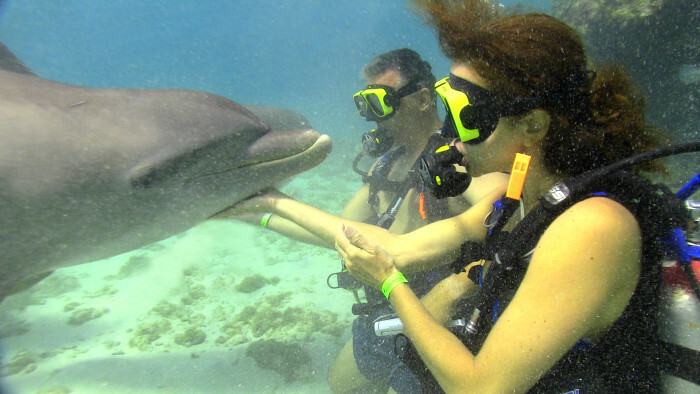 Now that we have re-established a connection with the underwater world, we are excited to dive together again. The next morning, we hopped on the Atlantis Diving bus with Rudi who drove us to the shore at Director’s Bay, located at the tip of Caracas Bay Island. Known to be one of the most diverse dive sites on this side of the island, it is where the famous Tugboat wreck sits upright at 5 meters. Chest-deep in turquoise waters, we descend breathing into the water and the feeling of weightlessness is freeing once again. 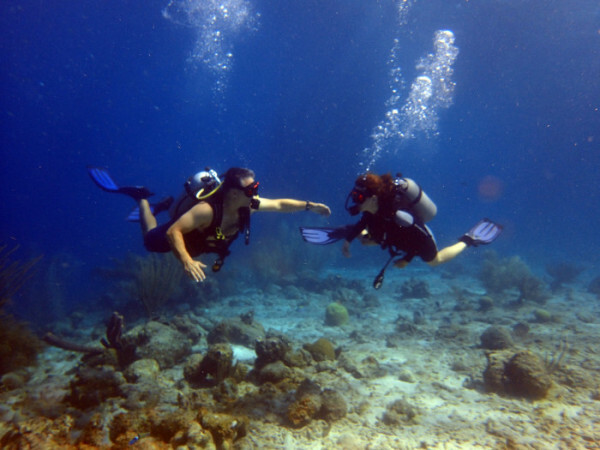 It started to feel like an underwater first date when my dearly beloved would reach out for my hand,. It’s a bonding and pretty romantic sensation where no words are necessary. Starting at 5 meters to approximately 12 meters, the reef is covered with Sea Rods, Sea Fans, Tube Sponges, Star Coral and an abundance of fish such as Sergeant Majors, Sea Horses and schools of Jack’s. In the deeper part, Black Coral and Elephant Ear Sponges dominate the wall. After we reach the desired depth we turn back to follow Rudi to the tugboat fully covered with a variety of coral formations, colorful sponges and plenty of fish circling the wreck. I have snorkeled and free dived here a few times but the experience of scuba diving here is out of this world. The volcanic limestone under the waters of Curaçao has been developing for millions of years, ultimately becoming a true work of art and I can’t help but feel grateful and privileged that we have an access pass to this magnificent underwater word. Today is our wedding anniversary and my husband Olivier does not suspect a thing. He thinks we are going to dive for editorial pictures. The team at the Dolphin Academy has been instrumental in making this dream of mine come true and also so cooperative working with my ideas prior to this day. Simple as it may seem, when you are down below accompanied by dolphins who follow cues and gestures, it may not be that obvious… It will all come together soon. The morning rays shine as they usually do in Curaçao and it’s time to meet up with Stefan, one of the experienced dolphin dive instructor at Ocean Encounters and Arne, the underwater photographer and owner of Turtle and Ray Productions. They are both aware of the grand master plan and play along. Arne also has the task of discretely placing the special gift for my husband on site. Olivier will have to find a strategically placed hidden treasure… All together we walk over to join with George Kieffer, director and dolphin trainer at the Dolphin Academy conveniently located just steps away. There they are, my favorite dolphins are poking their heads out of the water, greeting us by vocalizing with clicks and whistles. Tela is one of the dominant females and loves to be around her daughter Serena. They will be our lovely witnesses! I love catching the wondrous and delighted expression on Olivier’s face as we slip on our BCs and enter the water. We tranquilly descend and kneel on the sand. The scene is surreal. George points, and in an instant Serena and Tela majestically approach. It’s like a dream. They are both so graceful and let us caress them as they gently glide in front of us several times. George is ready for the first part of the plan. He signals to Tela, and seconds later, she brings down a familiar play hoop which I remove from her nose and hold onto doing my little happy dance. My husband is the next receiver but little does he know that she will be delivering a scroll attached to an unfamiliar object. Olivier extends his arm forward as instructed, and Tela glides over to him maneuvering a heart-shaped hoop. The intelligence of this mammal is astounding! Olivier admirably accepts the offering, glances over at me with an amused look, removes the scroll and reads my vows leading to the question. “In the presence of these majestic dolphins, on this day, celebrating our wedding anniversary, I ask you this Olivier, will you marry me again?” With no hesitation, he assertively nods with an ok hand sign and leans over for a regulated bubbly kiss. We spend the next few minutes enjoying our interaction with the dolphins, thanking them and the team for their awesome presence! Just before reluctantly saying goodbye to the noble dolphins who made our day exceptionally special, there is one thing left to do, Olivier must find his gift. With my guidance, he spots the dive watch that he always wanted. The shock and elation is very noticeable as he stares at it then back at me, slips it on his wrist and says “I love you!” through his regulator. It was also my first time echoing back those three words at 8 feet under!